Since 1985, aquatechnik® has been at the forefront of manufacturing the highest of quality of polypropylene heat fusion welding pipe and fittings for multiple fluid handling systems. Today, the firm’s manufacturing plant in Magnano, Italy produces a full range of PP-RCT fusion pipe and fitting solutions for export to a growing number of countries world-wide – now including the United States and Canada. A firm commitment to quality, reliability and safety has remained a hallmark of aquatechnik® success since its inception. 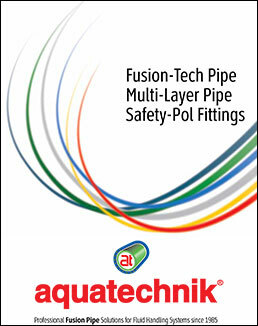 The aquatechnik® Fusion-Tech Pipe carries a 30-year warranty. All aquatechnik® products are made to meet and exceed stringent certification standards and, above all, the needs and demands of professional installers. In launching aquatechnik® in North America, it is clear that this proven flame-free PP-RCT fusion pipe installation will quickly emerge as a preferred alternative to conventional soldering and welding methods. The new aquatechnik® North America team believes that building owners, engineers, architects and mechanical contractors in HVAC and other sectors will welcome a versatile green building product that is safer, more affordable, easier and faster to install in a wide range of applications — always promising decades of reliable performance. Welcome to the future of aquatechnik® PP-RCT fusion pipe quality and reliability.